The test I so thoroughly decided was a waste of time proved otherwise; Bug has epilepsy. Wait…what? 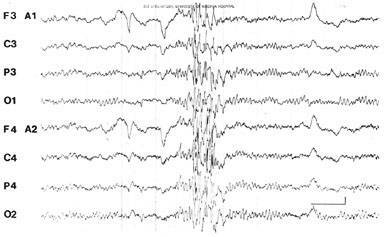 It took us a while to wrap our minds around it, and we aren’t quite fully wrapped, but basically, the definition of epilepsy is kind of a catch-all…the medical term for “unexplained seizure activity.” While he doesn’t manifest these seizures physically on a daily basis, the EEG he took showed several brief episodes while awake, during stimulation, and during sleep. Untreated, he could very well have another full-blown episode, the kind that turns you upside down and inside out, or start having those “absence seizures,” where he blanks out for a few seconds at a time. So after talking with the neurologist and following up with Bug’s regular pediatrician, we have almost nearly decided to start him on a mild seizure medication, a daily regimen that he will have to take more as a preventative measure than anything. According to our pediatrician, epilepsy doesn’t have the sentence on it like it did a decade ago. After maybe a couple of years episode-free, they will re-evaluate Bug and see if he needs to continue medication. If not, off he comes, and we go from there. And with this type of activity, there is a very fair chance that ug will grow out of it by the time he is in high school. So there we have it – a diagnosis, a plan, and a peace. Somewhat. This is what Bug’s EEG looked like – I googled this particular one off the internet, it isn’t actually his brain, but very similar to what we were seeing. Watching the test was a little unnerving, seeing these spikes every once in awhile and wondering what was going on. Is that normal? Like maybe they really are his bursts of brilliance – maybe he was solving the quadratic formula, or the economic crisis, or alphabetizing aquatic animals, all while fast asleep.